The previous week the winless run had been laid to rest with a splendid win over Everton. Prior to that you could have been forgiven for thinking would Burnley win again as the winless run got longer and longer; not because Burnley had been poor in game after game, in fact far from it. Bedevilled by injuries, long and short term, plagued by last minute goals against them, denied sure penalties and clearly suffering from a lack of anything that might be described as run of the ball, we’d gone home since mid-December after each game wondering more than once, just how did we not win that, or just how did we lose that? Dejection, however, was brushed aside with gammon and eggs at the Queen in Cliviger, or a Chicken Pie at the Hare and Hounds in Todmorden. You couldn’t grumble at the team. Down to the bare bones in some games they’d never given less than 100 percent, kept up Herculean efforts to win, but still the win would not come. Even so, there they were still in seventh place, well clear of the relegation pack, and all of us harbouring thoughts of just maybe, just maybe, European Football. Whether or not traipsing to far flung outposts in eastern Europe would be a good thing or a bad thing, bearing in mind the resources of the club and the distractions it might pose, might have been in the back of our minds; but the prestige and prospect of being able to say, “We’re in Europe next season and a nice little jolly to Malta or Portugal” seemed extremely attractive. It was a weekend in London with the Supporters Club for the West Ham game. From somewhere (and a lot of promotion on Facebook) numbers had increased for these weekend trips, so much so that a bigger-than-usual 6-wheel coach was needed for the near 50-something people who set off. Alas bigger does not mean better, the heating worked on two levels, oven or fridge, the air con was in out of order mode, several seats were stuck in the recline position which was fine if you enjoyed looking at the ceiling. And there was no hot water for the life-saving coffee or tea. Notwithstanding all that, the motorways were mercifully clear of hold-ups, the driver knew her way round London with her eyes shut, and she manoeuvred this unwieldy monster of a coach as if it was just a little mini. The halfway stop was Huntingdon not Banbury for a change. Alas Huntingdon lay wet and damp on a grey afternoon beneath sodden skies and the word ‘dead’ is totally inadequate to describe this once attractive ancient market town. If we say the most welcoming place in the little town centre was a Greggs, you’ll get the idea of how this place is now firmly on our ‘don’t bother again’ list. We headed inside to escape the drizzle. The most tasteless and near inedible cheese and tomato baguette remained half-eaten as we left. Oliver Cromwell was born in Huntingdon which could well explain why he was such a miserable buggar. London was mercifully quiet, no roadworks to interrupt the journey as we passed all the usual landmarks on the way into the Docklands area to find the Ibis London Excel hotel. Staff young and cheerful, they don’t sit at a reception desk in smart jackets; they sort of whizz about in red T-shirts and jeans with iPads, rooms small but bright, beds comfy, view of the Emirates Cable Car Sky ride over the Thames out of the window. Down for a meal, those who chose the fish and chips in our group regretting it; the rigid fish would have made a good Punch and Judy slapstick. The last London Ibis we had stayed in had an attached pub type restaurant which did just about the best meat pie, chips and gravy east of the Mississippi. Of course we headed for the Sky Cable Ride over the Thames on the Saturday morning, it’s a decent and exhilarating experience, but below nothing left of what was once the hub of the British Empire with ships and produce from all over the world loading and unloading, and the water a brown chocolate mess, although miraculously a Grebe was diving for fish and someone was actually swimming. All the while and in the hotel as well, we’d seen folks strutting up and down in jeans, cowboy boots, check shirts and Stetsons. What the hell, we thought, where are we? Does everyone down here dress like this? Actually no, in the O2 there was a three-day country and western festival going on. Inside on a stage in the entrance area a young lass, good as well, was strumming her stuff. If there’d been a stall selling boots and Stetsons I’d have rigged myself up it was that catchy. Unusually for me, with a cough and cold that would have felled an elephant I’d struggled around beneath a little black pork pie hat I’d got for £2. 49 at M&S. The lass on the till explained to me why it was only £2.49 but after about 15 minutes I’d given up listening. But a cracker of a little hat, I must say, the sort that Brian Cranston wears in Breaking Bad. A good hearty hotel breakfast is one of the foundations of The Meaning of Life, but pickings were slim at the hotel breakfast buffet, choice limited, no porridge, no fried eggs, most of the stuff snaffled by the Supporters Club early birds; I got the last slice of fried tomato, the last poached egg, but the bacon and sausages were plentiful, although as ever the bacon was only half cooked. Wins at West Ham have been few and far between since the 70s and so far this hadn’t exactly been the perfect weekend, my neck still cricked from looking at the coach ceiling; plus West Ham had been on a good run there since December, so optimism leaned towards glass half empty. Our esteemed driver found her way there easily, a couple of Burnley coaches were already there, West Ham stewards (irritatingly polite and smiley) were on various corners to liaise and point the way, at this point not a bobby in sight. The approach from the away supporters end car park not the most attractive, the big developments being on the other Stratford side of the stadium, a few more cars turned up as we strolled along out of the car park and towards the bag search area a few hundred yards away. Mercifully we were allowed to take our sandwiches in that we’d bought; at Man United taking in your own food is strictly verboten. At this stadium, however you can buy the longest hot dog sausage I’ve ever seen, a fiver I believe. It is so long you could make bicycle handlebars out of them. Much has been said and written about this stadium now that West Ham use it as their home and have left behind the land of Alf Garnett and pie and mash. Upton Park had its faults but it was traditional, part of the heart of the community, had a clear identity; was old style, a real home and had real atmosphere and passionate vibrancy. Turf Moor is much the same these days. No-one likes to come to Turf Moor. No-one liked to go to the old Upton Park. And so they moved to the Olympic Stadium. The bulk of the fans didn’t want to but they were sold a dream. New stadium, bigger stadium, rent it for a song, tart it up, dress it up, make it their own, crowds of 56,000, more money, more power, more investment, new players, step up to the next level, become one of the top six, head for Europe. Wow: it seemed so irresistible. 56,000 people buying a pint, a pie and a programme, think of the money; get the bubble machines out, play I’m Forever Blowing Bubbles over the tannoy. Who’d know the difference? It all seemed so plausible. All they had to do was win and everybody would be happy. But two years down the line they were far from happy. Offered a dream, sold a nightmare said the placards and banners. On the day of the game plans for protest marches had been abandoned. No-one was quite sure if this was because reason had prevailed and meetings had taken place, or the ultra-right thug group had threatened any marchers that they’d have their faces re-arranged if they marched through ‘their’ patch. The chairman of the moderate group was now apparently in fear of his health and safety having received various threats. March or no march, trouble was brewing; the pre-match tributes to Bobby Moore sadly a mere distraction and side-show, a prelude to the trouble to come later. Would the trouble have kicked off had West Ham scored first and gone on to win the game? We’ll never know. In the first half there was only one side in it, only one side that looked like scoring, only one side that played with any pace and desire. Twice Pope kept Burnley in the game making saves with his feet when a goal seemed inevitable. It was a half when Burnley could have easily conceded a couple of goals. Barnes was on his own up front; Burnley coughed and spluttered but managed to repel the West Ham advances that came down the left time and again. It seemed a matter of time before West Ham would score and in truth they deserved to. At half-time we felt like we were just waiting for the inevitable. With West Ham playing so well, the banter between the away fans and the adjacent home fans was genial and smiley. That would soon change. Dyche made the change we wanted; off went Hendrick and on came Wood to add more weight up front. Burnley were transformed. The resultant goal was stunning in its simplicity and power. A pull-back from Wood to Barnes who was steaming up to the edge of the box, a mighty shot, a cannon ball of a shot, a perfect strike that flew into the top corner like a missile. We were stunned then jubilant, West Ham fans were stunned, and then angry. Banter became abusive, simmering discontent became palpable. Two more Burnley goals added insult to injury, two of them scored by the rampaging Wood. And in-between, incursions onto the pitch by infuriated West Ham fans, disrupted the game, and had us civilised tolerant fans from the north, at first open-mouthed and then well-entertained as stewards seemed impotent and incapable of prevention. Incompetent, or just taken by surprise: video footage showed one steward eyes closed, actually asleep on his stool propped against the perimeter wall. It wasn’t if this stadium was short of stewards, but they were simply dozy, inattentive, never alert to the incursions, as protestors made regular forays onto the pitch. It was West Ham’s Mark Noble who summarily dealt with the first, upending him, semi-assaulting him, and in so doing losing all his focus on the game itself. Others came on; Barnes dealt with one with a deliberate profession foul, kicking his feet from under him with a panache that any old-style hatchet man from the 70s and 80s would have been proud of. Another fan raced on with a corner flag and with a flourish planted it in the centre circle and by now and even more ominously, hundreds of West Ham agitators had circled the directors’ box venting their spleen against owners Gold and Sullivan. 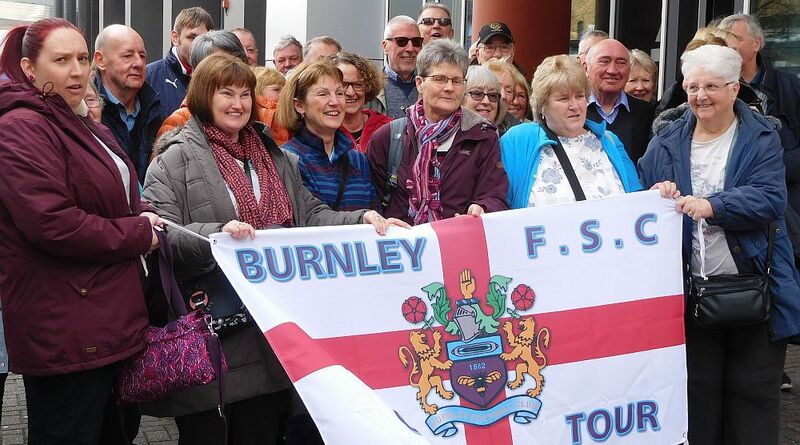 Others hurled abuse and threats over the gap towards the Burnley fans. Entertainment became discomfort at this point. Hart spilled a shot and Wood pounced to score the third. By now the stewards had given up on any plan to eject the intruders and were now simply catching them and throwing them back into the crowd. Those of us nearest the home fans wondered about a tactical withdrawal to the concourse. By now hundreds of West Ham fans were exiting the stadium. A few were fighting each other. John Motson said afterwards he’d never felt so frightened. Momentarily you wondered if the referee would abandon the game, or take the players off. There is a story that Dyche told him, “Oh no you won’t.” The Burnley subs gave their seats to young West Ham supporters caught up in the mayhem. The final minutes were played out. Stoppages might well have added up to several minutes but the referee used common sense and blew not much after the 90 minutes. We stood and laughed and celebrated, astonished at what we had seen, but delighted by the win. West Ham fans remained, surrounding the Directors’ area, their fury unabated. You could fill a page with complaints about the stadium not being a ‘proper football stadium.’ Experts have made pronouncements that it should have been pulled down and rebuilt. There are criticisms outside the ground especially regarding access for the home thousands via a packed shopping centre with insufficient escalators to cope. Home and away fans are separated on exiting the ground but then merge again to get to the station a mile away. Sensible folks remove their away scarves. West Ham extremists think nothing of attacking team coaches by the way; no problems for us, however, getting back to the coaches via the still segregated routes. It was an easy, straightforward return to the hotel. The gins tasted extra good as we sat and tried to make sense of what we had seen. The Italian meal across the road tasted extra good. It seems to be one of the laws of physics that all Italian Restaurants are bright, noisy, lively and vibrant. Our little gang went in and mentioned we were from Burnley and celebrating a fine win. Complementary drinks arrived. “We are Burnley from the north,” we announced and tucked in to good old Italian cuisine. A large Italian group were in there as well, a family group, mums and children and grannies, so noisy we could hardly hear ourselves. Amazing what a win does. My cold felt better, the food tasted belter, we slept like logs; we viewed the ailing bus with affection. On Sunday morning it took us to Covent Garden for a wander round. The cheese toasty I had there was as big as a flagstone, too big to finish, but then I’d had an early breakfast and managed to get to the poached eggs and fried tomatoes before they disappeared. This time there was some crispy bacon lurking beneath the half cooked stuff. We slept much the way home leaving London via Camden, a heaving mass of trippers and tourists and shoppers inching their way from antique emporiums, to trinket shops to bric a brac shops towards Camden Market. Pavements heaved witch people, the coach inched its way through. My eyes closed somewhere around where we joined the M1. When I opened them the Ricoh Arena was on our left. The coach temperature was somewhere around Oven Mark 160. This time we weren’t too fussed. West Ham fans were worrying about would their stadium be closed for the next game. Our worries were could we overtake Arsenal or not and take sixth place by the end of the season. Little Old Burnley eh; maybe we’re not so little any more. Those West Ham fans might well sing I’m Forever Blowing Bubbles. Maybe they need to change it to I’m Forever Blowing Raspberries.